Written and illustrated by Eisner-award-winning storyteller Darwyn Cooke (DC: THE NEW FRONTIER), Batmans original femme fatale, Selina Kyle (aka Catwoman) continues her incredible new adventures, walking a tightrope between a life of crime and the road to redemption! 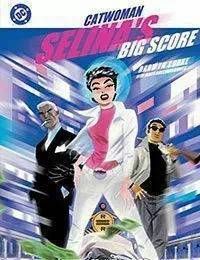 Selinas Big Score finds the feline thief presumed dead, cut off from her fortune and desperate to make a lot of money...fast. When she hears about a mob train full of unmarked cash, she assembles a crew of professionals to assist her in taking it down. She needs the money quick but is she ready for the consequences? Searing crime action, delivered in the acclaimed noir style that only a master of the form like Cooke can deliver.